Students celebrated Hanukkah in the Student Union Monday with Chabad of Buffalo. They ate traditional food, played games and collected toys and money for children with cancer in the Buffalo region. Chabad of Buffalo is working to ensure that Jewish students have a place to call home while they celebrate Hanukkah during the last week of classes. The organization held an event Monday, the second night of Hanukkah, in the Student Union with traditional food and games and lit an oversized menorah for all to see. The event raised $500 in cash donations in addition to toy donations for children with cancer in Buffalo. Roughly 2,000 Jewish students are celebrating Hanukkah, the eight-day Jewish holiday honoring the rededication of the Second Temple, according to Rabbi Sara Rich of Hillel of Buffalo. The holiday is celebrated Dec. 2 to Dec. 10 this year, during the final week of the semester, which means many students couldn’t go home to celebrate. Chabad gave students menorahs for their dorms and staff travelled between North and South Campus to cater events around students’ busy schedules. Rivka Gurary, wife of Rabbi Moshe Gurary of the Chabad House, helped organize the event to give those who can’t see their families a “sensation of home” during the holiday. David Landau, a freshman accounting major, is happy to be celebrating his first Hanukkah away from home with Hillel and Chabad. “I found my family here [with Chabad] and my family at Hillel and they kind of substitute the family I’m missing back home,” Landau said. Jordana Chazan, a sophomore communication major, said she is celebrating Hanukkah with her roommates by lighting their menorah together and sharing gifts each night. She said events like Chabad’s are comforting and help students who may be less religious celebrate with their community. Chazan said she believes it’s important to celebrate Hanukkah openly, given the historical context of the holiday. Legend has it, after years of war with the Syrians, Judah Maccabee rebuilt the altar of the Second Temple, but did not have enough oil to keep its menorah lit for seven nights. When the menorah’s candles lasted for eight nights, the Jewish sages were inspired to create the annual eight-day celebration. Chazan said she’s glad the event and candle lighting were held in the Student Union instead of at Chabad or Hillel because it allowed more people to see how Hanukkah is celebrated. Jacklyn Walters is the asst. 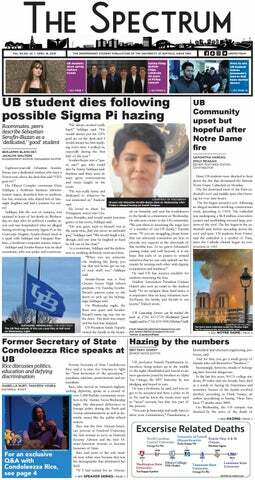 news editor and can be reached at jacklyn.walters@ubspectrum.com. Jacklyn Walters is a junior communication major. She enjoys bringing up politics at the dinner table and seeing dogs on campus.